Home »Automation»Jenkins»How to use credentials in Jenkins projects? How to use credentials in Jenkins projects? Some time ago I published a post in which I explain how you can create credentials in Jenkins. It’s very important topic because there are several ways to manage the credentials, but not all of them are safe. I showed you in my post how to use Credential Plugin, and it’s enough for adding, storing and managing secrets, but not for using them in the builds. I think this topic should have a separate discussion, so I decided to make this post. So now you will learn how to use credentials in Jenkins projects! One can add and manage credentials by the Credential Plugin. It stores the secrets in encrypted forms, so – in theory – no one will know the stored passwords and tokens. It is possible to pass on the password in the project as the parameter, but it is not recommended. The parameter of type “password” is only masked by the HTML input type “password”. Also, it is not stored globally – if you have many projects which require the same username/password pair, you must define the same parameters with the same values in the every one of them. But how can you pass on your credentials to the job? The simplest way is using the Credentials Binding Plugin. It allows you to binds your credentials to environmental variables, so then you can easily attach them to your builds. username and password (separated) – username and password in the two variables. Of course, you can choose only these credentials, which you have previously created. 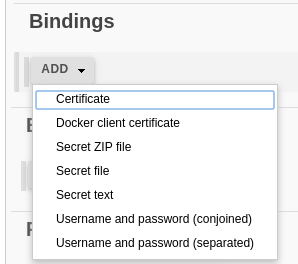 So if you don’t remember/don’t know how you can create and store credentials in Jenkins, please visit my post, in which I explained this topic. Since you have some credentials and you want to bind them, you can simply name the individual variables. In the example above, I chose two types of secrets: secret file and username and password (separated). As you can see, I had to fill in some fields, which correspond to the right parts of the credentials. I have bound credentials – what now? Jenkins exports environment variables consistently, but you access them according to the scripting language in use. So in your shell script smtp example, an environment variable “foo” can be directly accessed with “$foo”. But in PowerShell, environment variables are accessed by using the expression parser, syntax “$env:foo”. You should build your bindings according to the scheme. If the list informs you that every variable starts with some prefix, you need to use this prefix with your credential variables. How to run Jenkins with docker? A clarification on the environment variables – Jenkins exports environment variables consistently, but you access them according to the scripting language in use. So in your shell script smtp example, an environment variable “foo” can be directly accessed with “$foo”. But in PowerShell, environment variables are accessed by using the expression parser, syntax “$env:foo”. This is why you see different ways of accessing the environment variable after Jenkins exports it. Thank you very much Jeff! I let myself add a part of your comment to post, of course with a notice that it’s your comment. 🙂 Thanks to this more people can read your clarification. But if you mind, I will remove that part – just let me know! Thanks for posting detailed explanation. Is there any specific format for “Secret File” to store credentials? Please share if you have thoughts on secret file. How to use $credential = get-credential in powershell script, and than run thad script with Jenkins. I’m not sure whether I understand you well. Do you mean that you have credentials stored somewhere on disk or something similar? Or do you have an external script which you want to run in Jenkins, previously downloading it from the repository? You should be able to use “credential binding” functionality for almost every idea you will find. If you run an external PowerShell script, you should pass a variable with a credential as an argument and it should work (but I have not made any tests).